Our showroom features full kitchen and bathroom displays, contemporary to traditional design styles, and plenty of space. We have a large stock of stone samples for you to use and invite you to bring your own paint, cabinetry, and tile samples. Our in-house cabinet guy can provide samples upon request also. 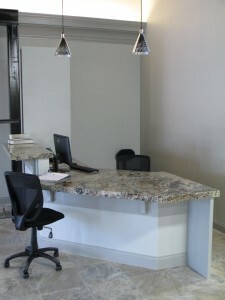 Appointments are preferred so we can be as accommodating as possible, but are not required.